That the only truly reliable narrator is life itself. where it is literally impossible to predict where it’s gonna go next. Occasionally I come across such a film that knows how to surprise me. At first, I wondered what it was all about. Usually, I take a wait-and-see approach and see where it’s going. If there’s no improvement in terms of story and it remains quite uninteresting, I’ll give up. Fortunately, this rarely happens. And certainly not in the case of “Life itself“. As the film progressed, it became (at least for me) more fascinating. Before I knew it, I was looking at the credits with astonishment and I thought to myself: “Wow, what the hell was this”. A film that succeeds in making me quiet and paralyzed. That’s quite an achievement. In retrospect, I was somewhat surprised at the negative comments regarding this film. I do understand there are people who are allergic to tragedy, drama, and sadness in films. But the bursts of tirades being fired at this movie, are rather exaggerated in my opinion. Or is it my anarchist nature that is rebelling? Calling “Life itself” the “Worst movie of the year“, is a bit shortsighted and slightly simplistic. I suppose those who did, only watched the crème de la crème of films that year. I dare to admit that I’ve seen much worse last year. Again it looks like a snowball effect after the appearing of some reviews of prominent film critics. And expressions such as “semi-intellectual”, “philosophical ramblings” and “overly melodramatic” are copied excessively so that it resembles a we-against-them situation. Or is it an acute case of navel-gazing? Or are they all male critics who, just like Dan Fogelman said in an interview, hate films with emotions? Maybe a defense mechanism so nobody would say that their tough torso contains too many female hormones. Oh well. If you focus on the correctness of timelines and the correct layout of the different time sections only, you may lose sight of the larger picture. I am convinced that among those notorious critics, there are some who unknowingly believe in certain things that would fit perfectly into the context of this film. Isn’t it so that people speak of a soul mate who exists somewhere on this planet? That there’s this one special person somewhere who’s a good fit for you? And isn’t the term karma used all the time? Does coincidence exist? Or coincidentally not? And then the pinnacle of mysterious power that millions believe in. The divine power that watches over us and directs our lives. I bet some of those opinion writers have used these terms before? Or that they want to save their soul every week by solemnly entering a church somewhere? Well, not me. Am I too realistic? Too suspicious? Could be. But I believe that a combination of circumstances and destiny can form the basis of a story such as “Life itself“. The first chapter is phenomenal. Without a doubt, the first chapter is the one with the most impact. A chapter full of confusion, psychological distress, and trauma. But also a chapter about eternal love. Finding that one specific person who fits you unconditionally. Will (Oscar Isaac) and Abby (Olivia Wilde) are such a couple. The living proof of the well-known saying about the pot and the lid. Until one day Abby leaves Will, and Will’s life immediately becomes a mess. A ruin that needs to be restored with the help of a psychologist. It’s a chapter in which the storyline wraps itself ingeniously around Will’s past and present. With and without Abby. With and without the will to live. A chapter full of flashbacks. A chapter introduced by Samuel L. Jackson who represents the “unreliable storyteller”. The subject of Abby’s thesis. But at the same time, he plays a character from a script that Abby and Will wanted to write together. “A husband and wife Tarantino”. That’s why Samuel L. Jackson uses his “Pulp Fiction” intonation. And then there are some who claim that his contribution adds little to the story. well, you just have to want to see it, I guess. The chapter ends shockingly. A blow of a sledgehammer, as it were. And from then on the story begins to spread intercontinental. From the rebellious Dylan (Olivia “Me and Earl and the Dying Girl” Cooke), the end result of the wonderful love between Abby and Will, whose life is dominated by death. To Spain, where the rich olive oil manufacturer Mr. Saccione (Antonio Banderas) tells his life story to one of his workers, Javier Gonzalez (Sergio Peris-Mencheta). And although these two different family trees initially have nothing in common with each other, the two storylines melt together in a bewildering manner. But you have to discover for yourself how it all gets connected. The only flaw I could think of is the predictability at a certain moment. At first, you don’t have a clue what’s going on. Once you’ve passed that point, you can already see where it’s going. 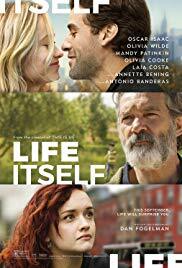 If I were a nitpicker, I would use this to criticize “Life itself” harshly. But the inventive story and the sometimes excellent acting of a group of well-known actors make this a side issue. Perhaps it all seems doom and gloom. As if real life only produces sorrow and misery. Where you experience one setback after the other. Everyone has bad periods in their lives and emotionally difficult experiences. But perhaps the message is also that there is always light at the end of the tunnel. I don’t believe in coincidence or destiny. I don’t believe in a heavenly power that determines our lives and sets out the route in our lives. But admit it. The way the story developed here could actually also occur in real life. Unfortunately, sometimes life is indeed an unreliable narrator.